Welcome to this week's belated My Week In Words. It was a pretty uneventful week with me not being too well and then just working away getting things done for finally launching mine and Eva's Etsy store. Nonetheless, I hope you enjoy reading what little I got up to this week. This post covers from Sunday 23rd to Saturday 29th of August. Enjoy! Sunday began with my usual fry up before I started work on last week's My Week In Words. After a shower I finished it off and had it scheduled for Monday. Then I could relax. My granda was taken into hospital the day before so my aunt was busy with my granny so she didn't visit as usual. I sorted the snails and did an egg check earlier in the day than I usually do. In the evening Les Miserables was on. I started watching it but I stopped half way through. I wasn't sure I was emotionally stable enough to watch the barricade boys be slaughtered. I attempted another Periscope but it was a bit of a fail. I guess people were too busy watching the barricade boys be slaughtered. After some crafting I headed to bed. Dad was off this week so he got me up on Monday. You know it's Dad's day off because he has me up in time to watch Come Dine With Me in the morning. I watched it with him while I ate breakfast. The first of my Blippo packages arrived on Monday, which was definitely the highlight. Look out for my Blippo haul post coming up this week or next. Most of the day I chilled and worked on blog stuff and then later on we headed to Bloomfield to do some shopping. My dad had to take my granny to the hospital to visit Granda so it was like a game of Supermarket Sweep. By the time I got home I had a migraine and felt super ill. Which was a running theme throughout the week. I felt breathless after eating Subway for dinner and ended up using my BiPAP. Eva wasn't feeling great either so we decided to get into bed and watch a documentary. Once I was in bed that was me for the night. 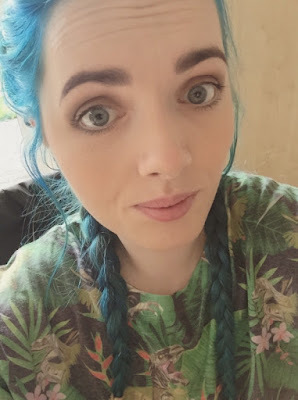 Last week's instalment of My Week In Words also went up on Monday, which you can find here. My second Blippo package and my new mini phone tripod arrived on Tuesday. I decided to get a little tripod to hold my phone rather than propping it up on whatever I could find. Nothing worse than filming something and your phone falling over. I thought it would be handy for Periscope too. Once again my dad got me up for breakfast and we watched Come Dine With Me while I ate. I did some blog work during the day and didn't feel too well again. I spent the rest of the day and evening chilling before I sorted the snails and let Rue out before bed. I also had an idea for a future blog post and ended up ordering something from Tofu Cute. I was able to limit myself to the one thing I needed. Wednesday started with breakfast courtesy of Dad. I'm not sure if it was a week off work for my dad or my mum. My Kawaii box finally arrived and even though I already knew what I was getting I was super excited to open it. 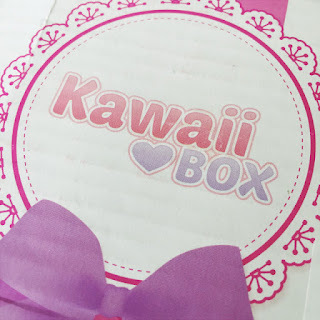 Look out for a future review post on my first Kawaii Box. Last week's Midweek Misc post went up. It was another Toys 'n' Stuff post but a little different than ones I've posted before. You can find it here if you missed it. During the day I worked on some bracelets before I showered. I then took an abundance of photos for future posts. I've bought so much cute lately! In the evening I just chilled before bed. I ate breakfast watching Heartland on Thursday. After eating I set about making more example bracelets for my Etsy store while I watched Heartland. By around 4pm I felt like I was dying. Okay... a little bit of an exaggeration but my chest was sore and I had a migraine. I guess probably from a mixture of bad posture and gritting my teeth while I concentrated. I ended up getting into bed to see if I could rest off my headache. By around 10pm I felt a bit better and, as I'd skipped dinner, I was super hungry. So I got up for dinner and fed the snails. I chilled for a bit but soon headed back to bed. On Friday I posted a review that was a long time coming. I wrote about one of my favourite adult authors. If you missed it you can check it out here. I spent a good part of the day working on bracelets while watching Heartland. After a few years I actually caught up to the latest episodes. It was kind of bitter sweet. I'm looking forward to the new season starting. On Thursday I was graced with the presence of a female's monthly blood sacrifice. This GIF basically encompasses how I felt. I was by myself as my dad had gone to golf and mum and Eva were in work, so I had no way of doing anything that would remotely make me feel better. It was utter hell. To make matters worse my mum took far longer to get home than she usually would as she had to walk because she couldn't get a taxi for whatever reason. I didn't think I'd make it out alive but after a few hours, and a scalding hot heat pad when she got home, I felt a lot better. I spent the evening chilling and looking through old fiction I'd started but left hanging since. I even found some characters I had started writing about and completely forgotten about. I really need to get into my fiction again. I just find it a lot more difficult than writing my blog. Eventually I headed to bed. My parents decided to go away for the day on Saturday and stay over in Portrush before the caravan season ends. So Eva and I were by ourselves on Saturday. It was a good day. We basically chilled and worked on stuff for our Etsy store. Eva's so talented at clay and I'm really excited to show off the things we plan to sell in our store. I also had a go with the clay but I wasn't as successful. Hopefully I'll get better with practise! My first attempt was this little guy. I was pretty proud for my first go. 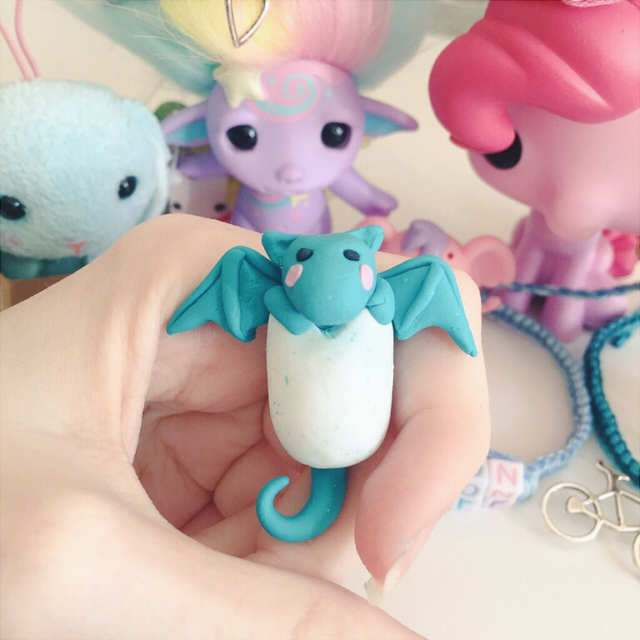 It's going to take a while before I'm good enough to sell any of my clay creations but I have so many ideas. I can't wait to share them with you guys! Later on we took a break and ordered Dominos. We watched television while we ate then Eva set about showering me and getting things ready for the Colour Run we were doing on Sunday. In the evening we both did egg checks. 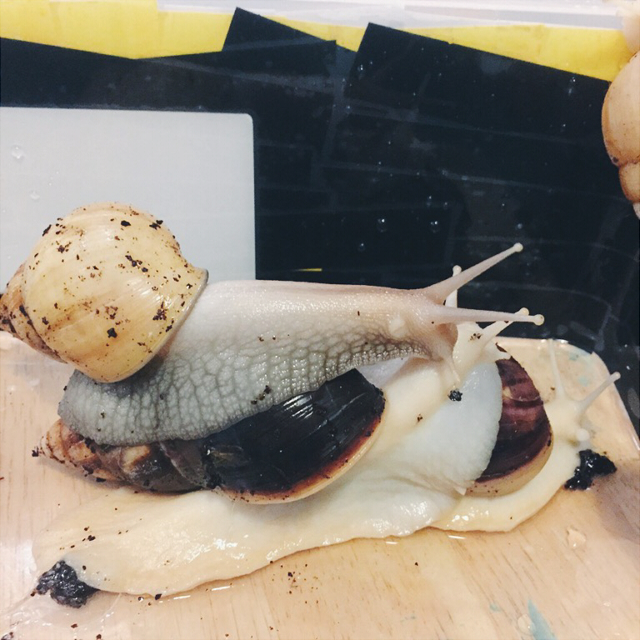 The snails were in a particularly entertaining mood. 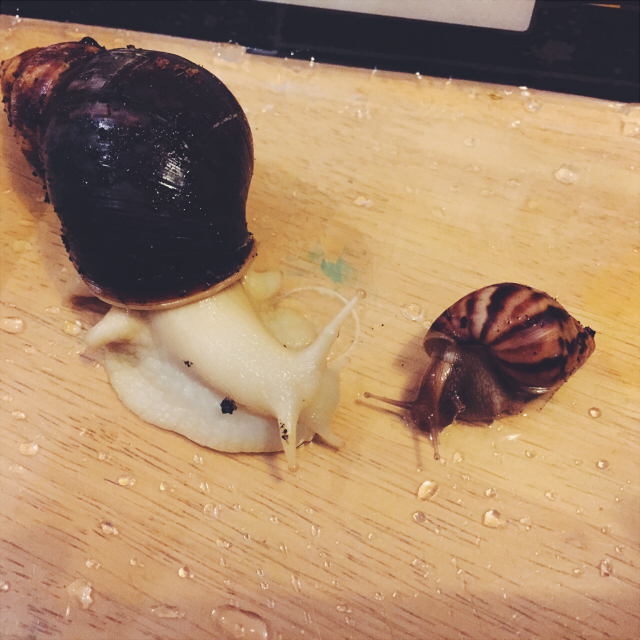 We introduced Eva's newest baby, Izzy, to my biggest snail Agron. The size difference never fails to amuse me. Since Gary's passing Agron is our biggest snail. Though I don't think he knows it. He isn't exactly careful with the smaller ones. 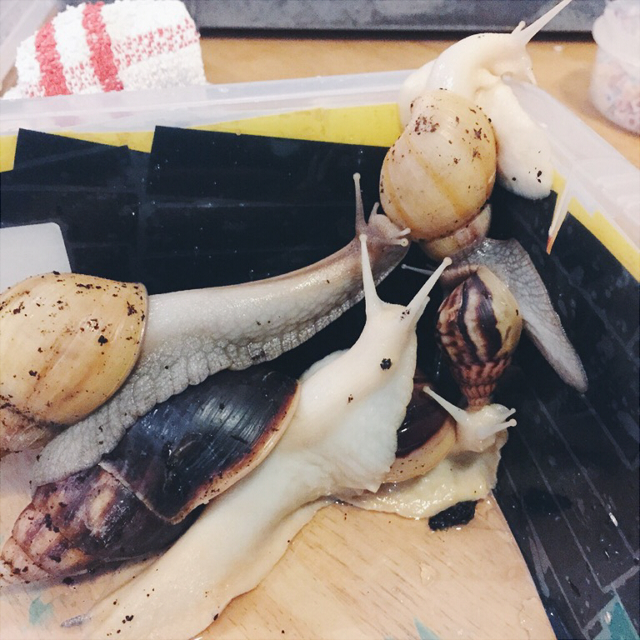 We then had a three snail pile up, featuring Gus (Eva's snail), Agron and Duro on top. Poor little Gus had both Agron and Duro on his back. Little Izzy and Violet were trying to escape but the big boys (I know, I know.. they're all hermaphrodites) but the boys had other ideas and tried to get them in on the action. Lucky I swooped in and broke up the party before Violet and Izzy got entangled but not before napping this hilarious photo. Fortunately for Pearl she was avoiding it all on the other side of the mini tank. After we sorted the snails we had a little more craft time before heading to bed. Will it be okay if I comment on your posts? Also, I'd like to buy the little bat guy you made if you still have it and want to sell him. (As long as it's not like $100 or anything. :) ) It's be awesome to have since it was your first attempt. And one last quick comment. The "three snail pile up" line was great.